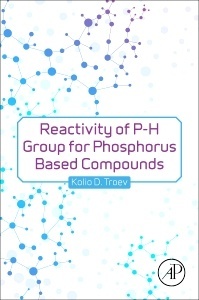 Reactivity of P-H Group of Phosphorus Based Compounds Troev Kolio D.
Add to cart the imprimé à la demande of Troev Kolio D.
Kolio Dimov Troev completed his undergraduate work at Higher Institute of Chemical Technology, Sofia; received his doctorate in the field of organophosphorus chemistry in 1974 from the Institute of Organic Chemistry, Bulgarian Academy of Sciences with Prof. Georgy Borissov; and was awarded the scientific degree “Doctor of Science in 1985 from the Institute of Polymers. In 1988, he became Professor of Chemistry at the same Institute. He has been the founding head of the laboratory “Phosphorus-containing monomers and polymers since 1989. His research interests are the areas of organophosphorus chemistry, especially esters of H-phosphonic acid; aminophosphonates; biodegradable, biocompatible phosphorus-containing polymers; polymer conjugates; drug delivery systems. He has been a visiting professor/lecturer in the USA (Marquette University, Tulane University), Japan (Tokyo Institute of Technology, University of Tokyo, Tohoku University, Tokyo University of Science), and Germany (Duesseldorf University). He is the author of more than 150 papers in this field published in the Phosphorus, Sulfur, Silicon and Related Elements, Heteroatom Chemistry, Journal of American Chemical Society, European Polymer Journal, Polymer, Bioorganic & Medicinal Chemistry, Journal of Medicinal Chemistry, Macromolecular Rapid Communication, Polymer Degradation and Stability, Journal of Polymer Science, Part A: Polymer Chemistry, European Journal of Medicinal Chemistry, Amino Acids, Tetrahedron Letters, Macromolecules, and RSC Advances. He is also the author of two other Elsevier books, Chemistry and Application of H-phosphonates (2006) and Polyphosphoesters: Chemistry and Application (2012). He was a director of the Institute of Polymers, Bulgarian Academy of Sciences from November 2003 to February 2012.